Ringworm, which is scientifically called Dermatophytosis, is a fungal infection that affects different parts and areas of your body, like the nails, scalp, and skin. Ringworm is a very common communicable infection that is triggered by a fungus named Trichophyton Rubrum. Although anyone can get this disease, children tend to be the most affected as they are usually in closer contact with each other. Among pets, dogs and cats are common carriers of this infection. This fungus thrives in moist and warm areas. The disease ‘athlete’s foot’ is one where ringworm affects the feet and the ‘jock itch’ is when this fungus affects the groin area. Ringworm is caused by a specific type of fungi called dermatophytes. 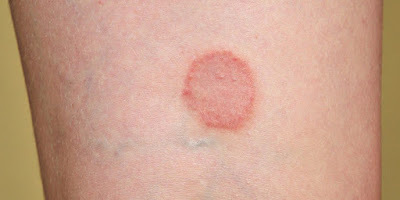 You can get affected by Ringworm by being in direct contact with an affected person. Sharing contaminated clothes and personal care items is also one of the causes of being infected by this fungus. Lengthy exposure to infected soil, though it is less common. Symptoms for Ringworm vary depending on area that is infected. Tea tree oil can be used to get rid of ringworms affecting the feet, which is commonly called Athlete’s foot. Different types of skin diseases can be remedied by tea tree oil as they contain antiseptic and anti-fungal agents. Direction of use: Take a cotton ball and soak it in tea tree oil. Remove the excess oil and apply it on the affected area. Repeat this at least three times a day for better and faster results. Try using oil of the same temperature as your body. To do that, boil the oil to bring it to your body temperature and use it for a better outcome. Olive leaf has great health benefits. Practically every section of the olive plant is advantageous for your health. Olive leaf acts as a natural anti-fungal, because of which it is very effective in killing the fungus that causes ringworms. The extract of the leaf has supplementary health benefits. It helps boost your immunity system which will further aid in your speedy healing. Directions of use: Infuse 250 gram of olive leaves for 3 times a day for the cure to work. Continue to consume the concoction for a week after the ringworms are cured so they don’t recur. Garlic is a wonder food. It has tons of health benefits. Garlic is seasoned with ajoene which has pure anti-fungal properties. It is used to cure various fungal infections, including ringworms. According to studies, it is suggested that ajoene is a great ingredient which helps in healing ringworms quickly. Directions of use: Peel off garlic clove and slice it into pieces. Place these thin slices onto the affected area and secure them by wrapping a bandage over them. You can also make a garlic paste and apply it onto the infected part. Lemongrass has heaps of anti-fungal, antiseptic and anti-bacterial properties. This helps in preventing microbial growth on the skin and in turn, helps in preventing the infection from spreading and healing it over time. Lemongrass also works as an astringent. It helps to dry out blistered ringworms by minimizing the pores on the infected area of the skin. Directions of use: Drink lemongrass tea at least three times a day for making the most of its curative effects. In addition to that, applying lemongrass tea bags on the affected part will help you get relief from the itchiness. The enzymes found in raw or green papaya can help in destroying old cell from the outer layer without harming the young skin cells. These enzymes damage the defence shields of various kinds of fungus, yeasts, and viruses. The presence of enzymes like chymopapain and papain, also helps in curing heal burns and inflammation, which makes it a soothing cure for ringworms. Directions of use: Slice a raw papaya into pieces and rub it on the affected are. You can also make a paste from these slices and apply it over the patches. Wash the paste off after 15-20 min. Repeat this for at least 2-3 times a day to get rid of ringworms. Apple cider vinegar has good acidic properties which makes them a good anti-fungal agent. Fungi cannot grow and spread in an extremely acidic environment, which makes this a good cure for ringworms. Directions of use: Use a cotton ball to dab apple cider vinegar onto the patchy area several times a day. Keep doing this until the patch fades away. For best results, repeat this 3-5 times a day for at least three days. Coconut is a simple ingredient which you can find at your home. It is very effective in helping you get rid of ringworms with its healing properties. Coconut oil is greatly used for scalp treatments. Coconut oil for ringworms offers enormous relief from itchy scalp and renders a smooth skin. Directions of use: Apply the oil onto the infected area. Massage the area for 2-3 minutes and keep it overnight. Wash it off the next day. Repeat this procedure for a few weeks till you start seeing results. Children and infants are more likely to be affected by this infection than adults. Lavender oil and Jojoba are a reliable remedy to use on babies that have ringworms. Directions of use: Take a teaspoon of jojoba oil and mix one drop of lavender oil in that and dab this mixture on the affected area with a cotton ball at least 3-4 times a day. Repeat this procedure for a few weeks for best results. Mustard seeds are a great home remedy for curing ringworms. They are tiny in size but they work wonders on itchy and swelled ringworm patches. You can prevent further skin infections caused by scratching by applying mustard seed paste on the infected area. Directions of use: Soak mustard seeds in water overnight and make a paste of it by grinding the seeds next morning. Apply the paste onto the affected area and wash it off after about an hour. Repeat this at least once daily for 2-3 weeks. Aloe Vera is a great herb and very useful in treating various kinds of skin problems. Its antiseptic, anti-fungal, anti-inflammatory and antibacterial properties make this a great home remedy for getting rid of ringworms. Directions of use: Cut one leaf from the aloe vera plant and apply its gel onto the infected part. Leave the gel for about 15-20 min and then wash it off with lukewarm water. Repeat this procedure 2-3 times a day for greater results. This household ingredient has great anti-bacterial and anti-biotic properties. This traditional home remedy is extensively used to cure skin infections including ringworm. You can either use turmeric oil or fresh turmeric roots on your infected and patchy area. Directions of use: If you are using turmeric oil, then pour a few drops of the oil onto the affected area. On the contrary, if you are using turmeric roots, you need to crush the roots and make a paste with water and apply on the area. If you are using turmeric powder, then mix it with water to form a paste, apply it on the infected part and wash it off with lukewarm water and soap after 15-20 minutes as turmeric tends to leave a stain. You have seen above that vinegar is a great home remedy to cure skin infections and salt acts as an astringent which helps dry off ringworm patches. You can mix salt with vinegar to make a paste. Directions of use: Apply the paste directly on the ringworm infection and leave it there for at least 5 minutes. It takes around 7 days for the infection to vanish completely. Extract from the grapefruit seed is a fine antiviral and antioxidant agent. Ringworm infections clearly indicate a compromised and weak immune system. Grapefruit seed extracts (GSE) help in internally boosting your immune system making your body less susceptible to this fungal infection. You can also apply GSE on your rashes directly to treat them. Directions of use: Mix GSE and water to make a paste and apply it on the ringworm rashes or patches. Keep it on for a few minutes and then wash it off. Repeat this 2-3 times a day for positive results. Oregano oil is known to be therapeutic in nature and is an effective natural anti-bacterial and anti-fungal home remedy that will help you get rid of ringworm infections naturally. You can take oregano oil both externally and internally. Directions of use: If you wish to take oregano oil internally, then mix 5-10 drops of pre diluted oregano oil with water and take it 3 times a day. For external use, apply oregano oil on the infected area at least 3-4 times a day for positive results. Camphor is derived from the wood and bark of camphor tree. It is famously known as one of best home remedies for getting rid of ringworms because of its anti-fungal properties. Directions of use: You can use camphor in three ways to get rid of this fungal infection. You can rub a pinch of camphor on your ringworm patch. If this doesn’t suit well, you can mix some sesame oil with camphor powder and rub it on your infected area. Repeat this twice a day. This third way of using camphor is to mix 2-3 drops of diluted camphor oil with some olive oil and applying this mixture on the rashes twice or thrice a day. Maintain good personal hygiene and immediately consult a doctor if you see some rashes forming.